Public Water Now, the Peninsula group leading the attempted public takeover of California American Water, is filing formal complaints this week against the company with the state Fair Political Practices Commission and Monterey County elections officials. Among the allegations are that the private utility company violated election law by fighting Public Water Now’s petition drive without forming an official campaign committee, by failing to report its expenditures as required by state law and by sending out paid obstructionists to interfere with legitimate efforts to collect referendum signatures. Cal Am spokesman Kevin Tilden called the complaints “the same old crap,” “total garbage,” and accused Public Water Now managing director George Reilly of lying on this and other subjects. Tilden said the action reminded him of Reilly’s unfounded FPPC complaint against former Carmel Mayor Jason Burnett, which, he said, was found to be groundless. However, both Reilly and Burnett said Thursday that there was never any such complaint. “I don’t remember George filing an FPPC complaint against me,” said Burnett, who worked closely with Tilden and other Cal Am officials on the company’s long-stalled desalination venture. “Tilden is mistaken,” said Reilly. Although Cal Am paid field workers to attempt to dissuade area residents from signing the takeover petition, Public Water Now collected enough signatures to qualify the takeover plan for the November ballot. Cal Am also sent out mailers providing instructions on how people who had signed the petitions could get their signatures removed and failed to report the costs as campaign expenses. Some of Public Water Now’s allegations against Cal Am will be included in a separate complaint to the Monterey County District Attorney’s Office, according to Reilly, a longtime Peninsula activist and water expert. Reilly referred to the Cal Am field workers as “blockers” and said they stalked his group’s volunteers who were attempting to collect signatures at various public locations. “The blockers sought out and only came around when PWN signature gatherers were present. They stood very close, tried to engage our volunteers in distracting criticism, tried to cause a reaction, and assertively tried to hand flyers primarily to those approaching the PWN petitioners,” Reilly said. He said on two occasions the interaction caused others to report the confrontations to store managers who then asked all involved to leave the area. Reilly contended that the attempt to interfere with signature collection violates the state Election Code, section 18620. The PWN complaints also name FieldWorks, which supplied the paid blockers, and something called Monterey Water Works, which, among other things, is operating a Facebook campaign that mischaracterizes the takeover measure and Cal Am’s progress toward solving the region’s water shortage. The complaints also allege that Cal Am has improperly used county voter registration rolls as part of its opposition campaign. The complaint to the state Fair Political Practices Commission suggests that Cal Am be fined at least $117,500 and ordered to curtail its political activities until it is properly registered as a campaign organization. Letters to local residents suggesting they remove their names from the Public Water Now petitions violate state law, Reilly contends, because the campaign organization behind them was not identified. The materials said they were paid for by Cal Am and not by Cal Am customers, but the company provided no evidence to support that claim. Cal Am’s Tilden said the company’s lawyers advise that there was no need for the company to create a campaign committee, because it was only urging people not to sign the petitions and was not recommending a yes or no vote. He also said it there was nothing wrong with the company saying in its campaign materials that water rates have gone up wherever public takeovers have occurred, even though an industry-financed study on the subject contradicts that assertion. “They just haven’t gone up yet,” he said. If approved, the ballot measure would require local officials to conduct a feasibility study of a public takeover of the utility and would set off a number of steps toward that end. 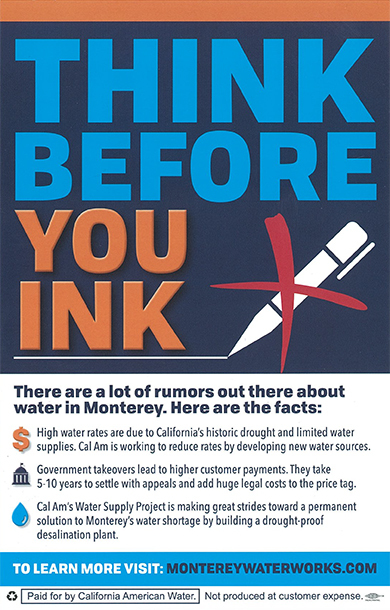 Although Cal Am has beaten two previous ballot measures, opposition to the company’s continued presence here has grown, largely because of water rates that are now the highest in the country and also because of the company’s fumbling and expensive attempt to build a desalination plant without significant progress. Have something to say about this story? Send us a letter or post your comment below. The alleged violation, and PWN has a lot of facts to support it, that Cal-Am’s actions, by scripting and using contractors to intimidate and interfere with voters rights, is a direct violation of the Calif. Election Code. The section that applies characterizes such actions as illegal and criminal. Under the Code anyone found guilty of these forbidden actions are susceptible to a fine AND incarceration, anywhere from a minimum of 18 months to a max of 2 to 3 years. If I were Cal-Am, instead of calling George Riley a liar, I would hire a competent criminal defense attorney and make every effort to correct the illegal actions and to mollify the judge, iii he/she finds them guilty, so the “penance:” is not what he could be. And if I were the judge who finds Cal-Am guilty, I would hand out a stiff penalty to give a strong lesson that money and even political support does not put you above the law. And, finally, if I were the DA and became in possession (all he has to do is access Riley’s complaint and Royal’s commentary) of this information, I would immediate undertake an investigation to indiependently determine the facts and if they support Riley’s complaint, go after Cal-AM with all the resources that the law provides. Does all this sound familiar: accusing political opponents of lying, after establishing yourself as a pathological liar, using any & all means to achieve political ends in order to make obscene amounts of money, corruption, borderline criminality? All we need from Cal Am now, to make the analogy complete, is to uncover Russian collusion.